One click the Rock Charts, Music Video Charts, Pop Music Charts, Dance Charts, US Single Charts and 80s Charts. The fastest option of downloading directly with video-to-audio conversion from well-known audio and video portals. With Audials you will get with one click the Rock Charts, Music Video Charts, Pop Music Charts, Dance Charts, US Single Charts and 80s Charts. Even Newcomers and Movie Soundtracks of the month you will receive freshly on your desk. You can find additional music suggestions and import the wishlists of other users in the Audials Community. You can access the complete discographies of your favorite stars with all their hits and albums by, for example, entering the name of a band or by using a special category for the top artists of a specific genre. With hardly any effort at all, you can have Audials deliver you the entire life works of a particular musician. In order to get an album, you simply click on the on the image of the album you desire in the artist directory. In addition, Audials also offers chart hits and even samplers to choose from. And, of course, you can select individual tracks as well. You automatically get the music tracks in any desired end format with all its ID3 tags, album images and even the song lyrics. No other software delivers music so quickly with full automation, for free and legally, doing so with all the extras you’d get in a real-life music shop. 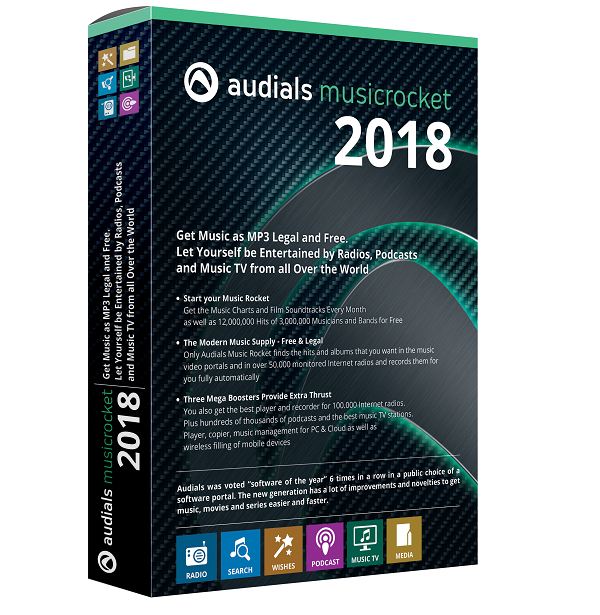 Audials Music Rocket simultaneously searches the best legal music sources to find your songs by your favorite music stars for you. 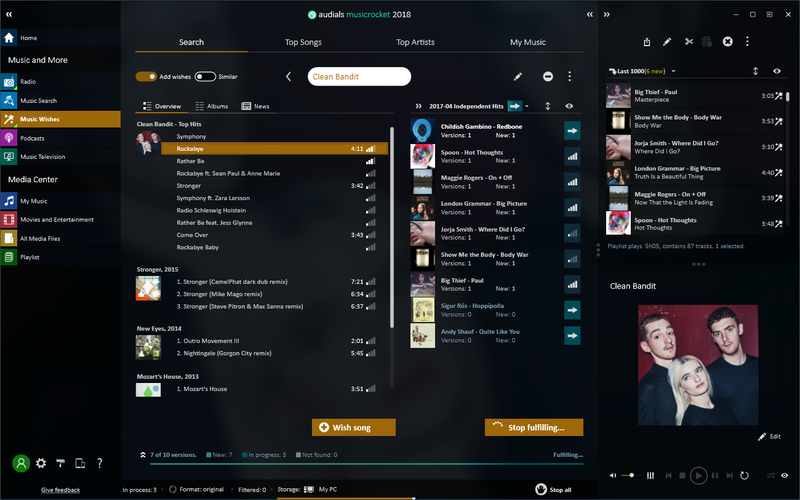 From the easily viewable search results, which are grouped according to album, you can immediately record the desired song as a music track or a video with one click. If you want, you can even listen to the songs that have been found before recording them. Tell Audials your music taste (by giving it a reference song, for example) and Top Songs will create a playlist of songs that match your taste via the music search. You can play and download the hits individually or grab them all at once. And it works for music videos, too. This means you can get plenty of new music from Audials in a matter of minutes. Top Songs also works if you select a specific genre or artist. Top hits are shown highlighted in the search results. With just one click on the download button, Audials delivers the desired music to you. 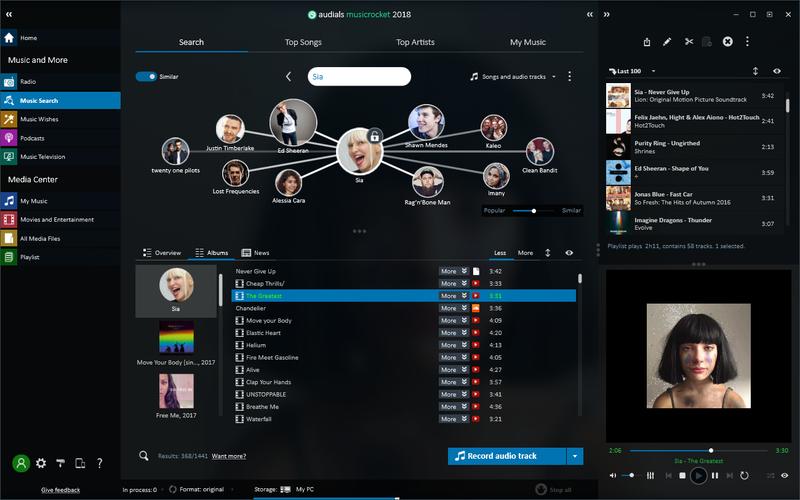 With the autoplay mode, Audials automatically plays the top hits that have been found, turning Audials into your own personalized radio station! Hot New Music with Climbers, Popular Tracks or Evergreens? You Decide! You can decide whether you want the latest hits, well-known tracks or evergreens from a particular genre. You can also narrow your selection even further by specifying the release year. 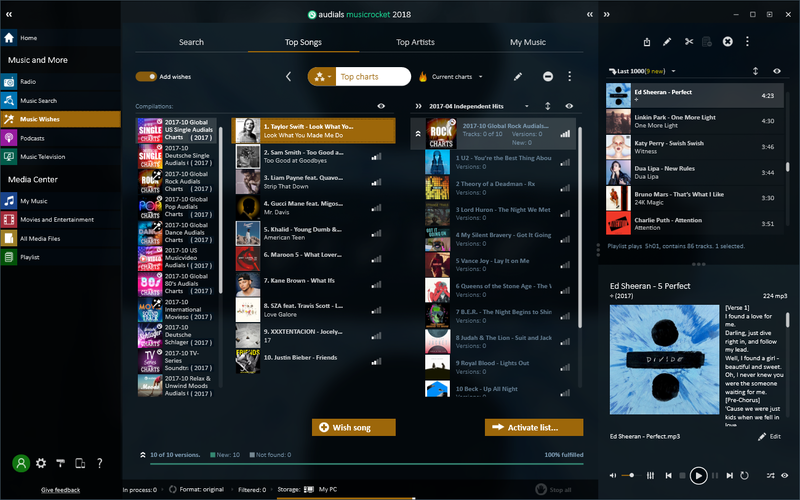 With Audials Music Rocket you get both your favorite artists as well as suggestions for similar music. Audials displays photos of bands and artists that are comparable to the musician you have entered. The artist directory offers an extensive selection with over 3,000,000 artists. On top of this you can also get new ideas from the top artist listings for 120 separate genres as well as charts and samplers. No other software can offer you all this. That's a promise! Along with all the top 100,000 radio stations, Audials also provides you with the best international radio stations. You can browse through stations in the conventional way according to music genres, countries, languages or locality. Or alternatively, you can find suitable radio stations quickly by entering your favorite artist into the dynamic search function. Why Not Just Download Another 200 Hits from the Radio? Instead of having to record all day, the Audials software allows you to download all of the hits played by your favorite show or DJ at once. Or you can just pick out the best bits. With Audials, the radio view also displays the 200 most recently played songs from your favorite station. If you want to be really smart, you can download your favorite songs via the music search and then add the playlist of your favorite DJ afterwards. Simply select your favorite music genre and Audials will automatically record only music tracks that belong to the desired genre from the best radio stations for that genre. You can set a recording limit by using the radio timer for recording duration or by limiting for the total number of recorded music tracks. You can record all tracks from any number of radio stations automatically and have them saved as individual music files. The songs are recorded perfectly from the radio streams, enriched with ID3 tags, album images and song lyrics and then saved as music files. You can play radio stations, music, videos, podcasts and films directly in Audials with its integrated player. This can be done in a detached window, in the main window or in full screen. Audials enriches your music collection with ID3 tags, ensures consistent normalization of your tracks and plays them using its own player and playlists for your entertainment. Using the playlist generator you can have playlists produced automatically with ease. Simply enter a genre or artist and Audials generates a new playlist with suitable music. Of course, you can also manually drag and drop music tracks to these playlists from your music collection. The most popular clouds, e.g. Windows OneDrive, Google Drive or Dropbox have been preconfigured and can be filled up just like a portable device. Access the media on all your computers when you're on the move with your Android smartphone. Audials fills your smartphone or tablet directly with a USB cable at your PC or over the Internet. Simply leave your PC running and with Audials Anywhere you can access, browse, play and download your media at any time and in any location. The new artificial intelligence of Audials Music Zoom has placed almost every musician of all time on an almost infinite map of stars according to musical genres. Zoom in with 3D-feeling and explore the music universe! In this way, you can play the complete discography of a selected musician directly with one click and even better compared to the freeware: RECORD! 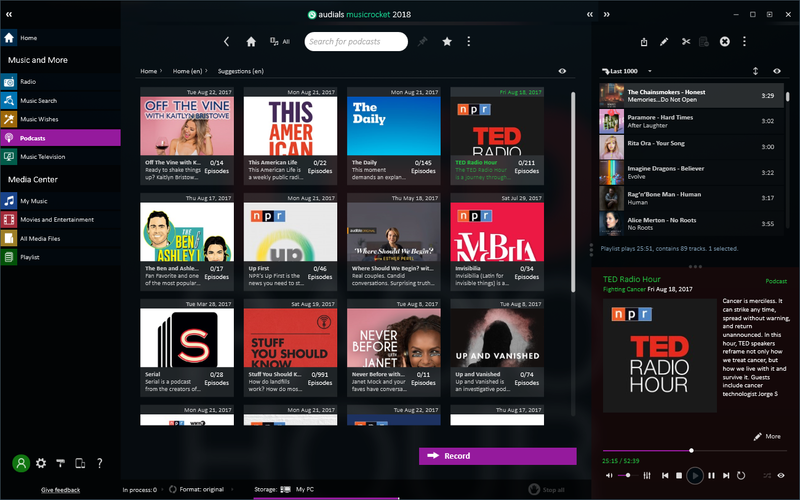 With the self-updating podcast database, you can subscribe to, download and enjoy 260.000 different podcasts for free and as audio or video shows from the best podcast providers in the world! Audials entertains you non-stop in its own media player with loads of the best music TV stations. With Audials music TV you can simply sit back and chill.